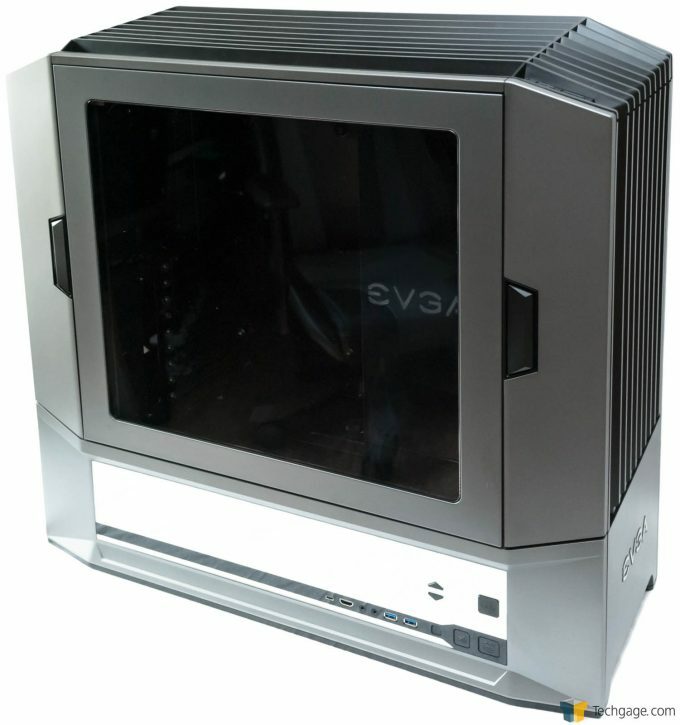 EVGA has been expanding into more and more markets lately, including computer cases. This is not an easy market to break into, with so many already great choices out there. EVGA is making an aggressive move into this market with its DG (Designed For Gaming) series of cases, and as we find out, there’s lots to be impressed by. A computer case is likely to be the most personal, and should be the most thoughtful selection of your entire build. It has the potential to house several motherboards, GPUs, etc, installed over the years. You may even upgrade fans and coolers over the years, but the main shell of the case will remain. This is largely thanks to ATX form factors that are keeping manufacturers adhering to standards that have been largely unchanged over the years, even when other technologies are leaping forward. When selecting a computer case for your build, there are many, many things that you have to consider. Aesthetics are certainly important, but you also have to consider things like air flow and cooling efficiency, expandability, accessibility via external USB or HDMI ports (HDMI is great if you are going to be using or adding VR to your repertoire) and so on. You have to consider whether or not you want to add things to a 5.25” slot, such as Blu-ray or DVD drives, additional USB connectors, fan controllers, A/V connectors, not to mention some of these GPUs being as long as they are. If you are into liquid cooling, you have to consider radiator placement, reservoir placement, etc. If you are in the market for a case, do yourself a favor and really spend some thought here, as your needs today may not even resemble your needs 2 years from now. 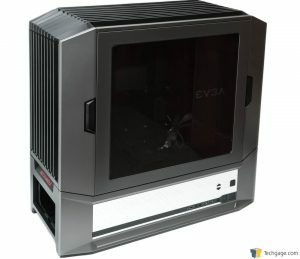 Today we are looking at the latest offering from EVGA, with its all-new line of computer cases that promise to cater to the most enthusiastic gamers out there. This new line is the DG, or Designed for Gaming line. None of the cases in this line are what you would consider budget cases, but the first case, the DG-84, starts at MSRP of $149. There is also the DG-85, DG-86, and the flagship and what we are looking at today, the DG-87. These are priced at an MSRP of $169, $199, and $229 respectively. This pricing is much lower than many enthusiast-class cases out there, and are what I would consider to be within reach of most home PC builders out there. There are many more features in this case, let’s take a look under the hood and see what’s going on inside this leviathan. Let’s get the obvious out of the way right now… this thing is big… like really, really, big. The DG-87 measures an incredible 686x270x642.45mm (27” x 10.6” x 25.3”) and weighs in at an equally incredible 43.2lbs (19.6KG). Needless to say, the DG-87 has an immense stature. Normally, I go for muted aesthetics when it comes to case design, which this EVG DG-87 case has, but also bold styling at the same time. The case is two-tone with a large mirrored surface on the side. 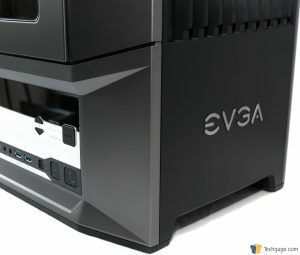 The front of the case has a very industrial look, with a large grill taking up the top 3/4s of the front, with the EVGA logo centered on the bottom section. The front easily removes with spring-loaded latches that attach at the top. This contains a screen to help catch dust, and hides the 3 140mm fans for the intake. The right side of the case is just a blank panel with a handle at the top for easy removal. With this panel removed, we find a myriad of cable routing options, cable hold downs, and more hard drive mounting locations than you can shake a platter at, up to 12 total SSD/HDDs. The backside of the case carries a similar theme as the front, just an industrial looking grill, with the PSU occupying the very bottom section. What makes this case special is, that the back section is actually a door that completely covers up all of your cords, and passes them through to a generously sized cord grommet on the back of the right side of the case. We also find two more 140mm fans attached to the door, and an HDMI cable for the pass through to the front connector. We also find an air flow diverter in between the two fans, more to come about that later. The left side of the case has a large plastic window on a door that opens easily at the press of a button. The door is also easily removable thanks to a quick release lever at the door hinge. The top follows the same theme as the front and back with the large grille, and towards the front left of the top we find two USB 2.0 ports, and a secondary set of reset, K-Boost, and power buttons. This is a great feature if you decide to put this tower on the floor. Just below the main door, we find the mirrored section which houses the USB 3.1 Type C connector, the HDMI connector, 3.5mm headphone jack, 3.5mm microphone jack, two USB 3.0 connectors, a reset button, the K-Boost button, and the power button. Just above these connectors we see buttons to control fan speed, and a mode button. There are 3 seven segment LEDs hidden behind the mirror surface that are only visible while the case is on. This readout gives you by default the internal temperature probe’s reading, and shows you the fan speeds for the front or rear when you cycle through the choices in the menu. The top section removes with a little force, allowing access to one included 140mm fan, and plenty of space for liquid cooling, or adding more fans if you choose. With the side door open, we find the main insides of the case, which is painted a matte black finish. On the right we find the dark plastic panel with the EVGA logo inscribed on it which comes out easily with the removal of one thumb screw, and the motherboard tray has a very large cutout allowing you the flexibility of using (I am sure) any liquid cooler you can think of easily.